The renovations to the 10th floor of William James Hall at Harvard University are designed to support three psychology professors and their students as well as provide testing facilities to support their research. Demolition included asbestos and PCB remediation efforts while still maintaining high levels of construction waste diversion. While modifications to the base building HVAC systems were not within the scope of the project, highly efficient active chilled beams, LED lighting and a robust control systems maximize the energy efficiency of the project space. 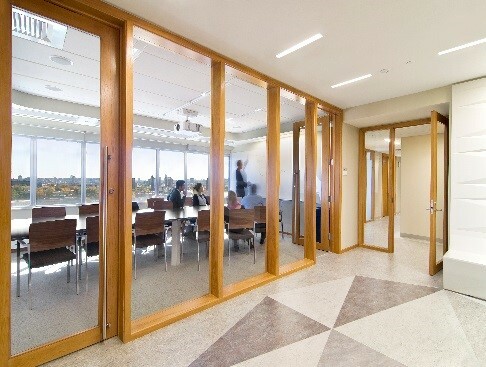 Testing areas, restrooms, circulation, storage, and other less frequently used spaces were positioned in the core of the building so that offices and conference rooms are able to take advantage of the glazing on the north and south facades of the building. Window films were added to reduce solar heat gain, resulting in a reduction of the size of the chilled beams. One of the most notable areas receiving the highest amount of points toward the Gold certification is the Energy & Atmosphere section. Lighting power reductions compared to an ASHRAE 90.1-1999 baseline reached 26%. In most spaces when occupancy is detected the lighting is turned on, but only at 50% power. This allows occupants to decide whether the full brightness mode is necessary. Optimization of HVAC performance was achieved through zoning and controls which improves occupant comfort by sensing individual space use and modulating HVAC systems in response to space demand.